You have always said that your life in the village of St. Mary Mead has given you examples of nearly every type of person—clues that help you solve new cases, by applying the lessons learned. And what a lot of shady characters and convoluted situations you have personally come upon in your sleuthing career! How we admire your steel-trap-like mind that picks up even the slightest clues to character and subsequent behavior—helping you uncover connections in your various tricky murder-knot episodes. 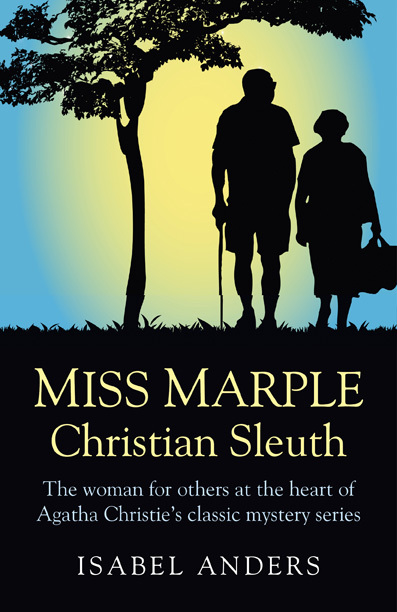 Please, Miss Marple, we need to know your secrets! How is a God-fearing elderly single woman—with limited personal experience of that wickedness—so able to enter the consciousness of a perpetrator? G. K. Chesterton’s legendary Father Brown knew of evil first-hand from his experience of the Confessional. But—how do you become sure enough to lead the police on so many occasions right to the culprit, often preventing even worse offenses from occurring? We need your feminine, unpretentious certitude—a key to your self-effacing boldness. It’s almost as though you personally followed this verse from the All-Virtuous Wisdom of Sirach (or Ecclesiasticus): “Watch for the opportune time, and beware of evil, and do not be ashamed to be yourself” (4:20). What other wisdom do you have to teach us? We surely need to listen and to learn from your example. Kything. It derives from an old Scottish word, “kythe,” meaning “to make visible.” Madeleine L’Engle famously used it in her “Time” books as meaning a kind of wordless, mind-to-mind communication in which one character nearly becomes another—receiving information through that person’s eyes and other senses. “Kything went far beyond ordinary ESP”—from A Swiftly Tilting Planet. What if we could kythe with each other, especially those we love? Louis M. Savary and Patricia H. Berne in Kything: The Art of Spiritual Presence (Paulist Press, 1989) assert that we can learn how to practice this intense identification-with-others-for-good if love is primary and our mutual desire to connect is strong enough. But the desire to kythe with another person need not have a romantic impetus. Think of a parent sending a son or daughter to school for the very first time. Wouldn’t it be incredible to be able to “follow” along invisibly, to protect and to savor and share through the child’s eyes and ears a whole new world? The applications of kything are endless—as long as both people consent on some level, much like agreeing to be prayer partners. So what, after all, IS kything? All I can say is that I believe it is NEITHER magic NOR nonsense. Don’t believe in kything? Well, deep identification with another person doesn’t have to have a word to describe it. And our “belief” in such intense connection and its possibilities probably will wax and wane to the degree that we are able to experience anything resembling it. Of course, if we don’t choose to believe it can happen, it’s very unlikely to. As a humble reader and ardent follower of your many successfully solved mysteries, your travels, and your evolution in popular culture as a “force to be reckoned with”—I must ask: How do you do it? With your plain, gray-haired, grandmotherly looks (though you are a lifelong spinster), your neat tweed suits, tidy hats, and sensible shoes—at first you seem a fade-into-the-background element of every scene you inhabit. That is, until your sharp-as-a-razor intellect kicks into gear, and you emerge from behind your perpetual knitting, cups of tea, and the occasional glass of sherry … to announce what no one else perceived in the splash of a murder or other dastardly event. Yet you grab our attention and turn our expectations upside down. Your quiet presence and simple pronouncements of what everyone should have “gotten” from the start are the thing of legend and of enduring respect. We continue to give you that, and to credit the genius of your creator, Agatha Christie, with sending you our way. For any readers who have yet to explore the paths of your ingenious life as a master sleuth (even if they have seen your movies, especially those with the divine Joan Hickson)—much pleasure and enchantment await in your twelve books and twenty stories of intrigue. So—don’t change, please. We need a reminder in your inimitable person that flashy looks and attention-getting hijinks are usually silly, ephemeral, and forgettable at best. We have an admitted glut of them already, floating through our culture, the real-life cast of characters and their mindless escapades changing daily. Yet you, Miss Marple, endure. And the world is a much better place for it. May I write to you again? “Find ecstasy in life; the mere sense of living is joy enough.” —Emily Dickinson. What gives you joy? A productive day of work produces a kind of quiet satisfaction, something to remember on waking the next morning as you begin afresh. But perhaps it’s not exactly joy, without some larger event or milestone to spark that ecstasy. Simply living and enjoying those you love, of course—but seldom is joy unmixed with the strain and worries that life inevitably brings day to day. Perhaps joy is that elusive quality that peeks around the corner when we’re doing what we most enjoy doing. It promises, it teases, but it seldom shows its full face or lingers for extended periods of time. Why? How can we get them back? Can we REMEMBER that the “mere sense of living is joy enough”? It is difficult. As in Dickinson’s lines about “hope”—described as “the thing with feathers that perches in the soul”—joy seems equally flighty and elusive—but nonetheless real. Joy is a subplot, a second narrative running beneath the plotline of my life, continuous as a heartbeat. Something in the soul (I’ve felt it from my earliest days) at times both beckons and intuits—in a line of poetry, a smile or a delicious fact that suddenly asserts itself—that we are made for joy. Call it Heaven or True Love or Fulfillment. Once we have known even a brush from its passing—or caught its aftertones in the air—can we ever NOT believe? We are fortunate to be part of a local worship community connected to an order of Episcopal Sisters—in which our priest/celebrant, preacher, and servers on Sundays are likely to be women. Of course, men preach and serve on some occasions. But to have women as our primary spiritual leaders, as we do, is a surprising and refreshing experience. It is a situation worth reflecting over, after about a decade of participating, along with my husband, in this unusual extended worship community (where he is a lay reader and server). Women were first ordained as priests in the Episcopal Church in 1974, and the former Sister in Charge at St. Mary’s, Sister Lucy, was the first woman to be ordained in the Diocese of Tennessee. At present two of the Sisters are already priests; one is on an ordination track; and a prospective novice is an ordained deacon soon to be a priest. With these leadership resources (several of the Sisters are also nurses, others have various advanced degrees)—it is no wonder that they are a center of spiritual nurture and sometimes surprising revealings of how God comes to us through the feminine spirit of godliness. Surely there is no difference per se in the fact of smaller feminine hands breaking bread and offering the Chalice of peace to communicants. Women have traditionally hosted feasts of all kinds, and this most sacred spread of a table is a natural and lovely outpouring of individual feminine gifts employed to benefit the whole. Yet not only the two sexes, but all individual persons embody and offer differences in style and presence that affect how we are brought into fellowship with God and each other through these acts. The Sisters’ generosity reminds me of this quote from 14th-century English mystic Julian of Norwich that “The mother’s service is nearest, readiest and surest”—something palpably embodied in these women and their ministry. And at St. Mary’s I find a spirit of nurturing that extends beyond the acts themselves: helping needy mountain families survive in these times; taking Communion, prayers, and gifts of food to the ill and shut-in; participating in civic organizations—seeing the disciplined spirituality of the Order reach lovingly toward the whole of our unique extended community and town. I mention only in passing that the Convent grounds overlook a magnificent bluff on the Cumberland Plateau, so that the changing backdrop scene (through the window above the altar) depends on primal elements of sun, rain, fog, and cloud. Not only women (and I am a laywoman) but any who worship here cannot but feel these connections to the natural cycle of days that women are attuned to and live by. Seeing men assisting in the furtherance and support of this feminine spiritual community in its ongoing ministry is also a beautiful thing to me, and reminds us that contrast and counterpoint are the essence of the art of life itself. It is not for nothing that in the Old Testament, Wisdom is personified as a woman, as in Proverbs 8: “ … whoever finds me finds life” (v. 35a).